First School carefully selected the location of each area due to various features of the actual land. The stage was placed at the lowest part of the property to allow for seating on the hillside, much like that of an amphitheater. The creek was designed to come trickling down a winding slope over rocks into a lower pool area. This large space is filled with growing plants, shrubs, and trees, which contributes to visual clarity and the overall beauty of the space. Simple names were given to each of the areas, including unique names such as; Climbing Decks, Garden Spot, Wilderness Trails, Trickling Creek, Digging Spot, and Cabin Cove. Each of the areas is clearly marked with a natural sign made from large tree cookies obtained from unwanted wood. Designed and carved by parent volunteers, they sit on top of recycled Osage Orange hedge posts, donated from a local farm. These beautiful signs on sturdy posts were created with no cost. Bushes, small trees, and low branches are used for natural area dividers, allowing separation from each other. Natural building materials and components are found throughout the space and used for seating and musical instruments. A hollow log was found by a teacher on a field trip and later obtained and transported to the classroom. The cabin was designed and constructed by a builder who lives along the Sangamon River. Platforms built around an existing Green Ash tree provide a wonderful climbing area. 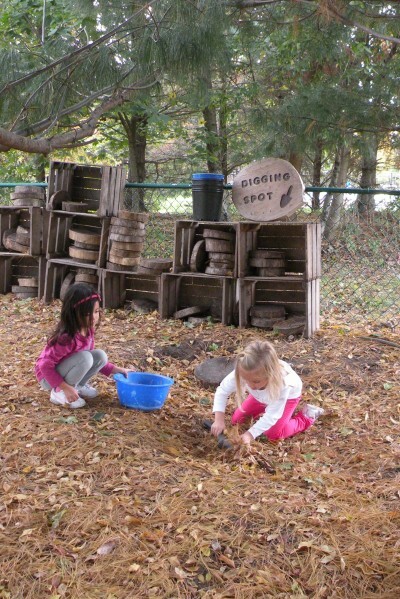 The Ash also provides shade from the hot sun and an opportunity for adding colorful scarves and fabrics which can be used for dramatic play. Osage Orange logs, with their beautiful, textured characteristics were used in these climbing decks and the entryway. This wood is very hard and resists deterioration. Tables, storage cabinets, and decks are all made of woods that resist deterioration, so little maintenance is required. The number of families involved in the development of the Nature Explore Classroom is no surprise because of the children and teachers joy in using the area. When projects were first started, a few areas developed quickly and photos were used to show the work. With these in place, photos were displayed on a presentation board at the entrance of the school for all parents and visitors to view. Immediate interest was generated from parents who wanted to help in some way. Teams were organized and were put in charge of completing the various areas.